Some of us really enjoy the basic, clean style of animated figures. It was really Batman the Animated Series that started the trend and style that most people call 'animated' today (at least in terms of superheroes), and that angular, simplistic form translates well into all kinds of properties. 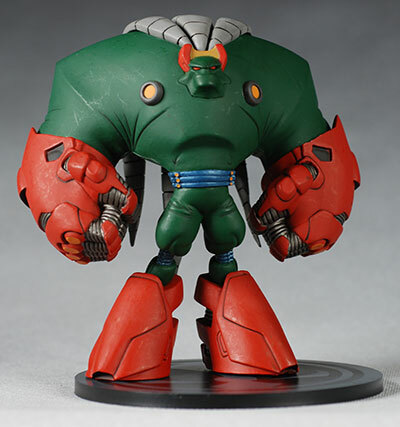 Spawn 30 took our favorite hamburger head to the animated world. Yes, Spawn had actually BEEN animated before on HBO, but in a very realistic style. 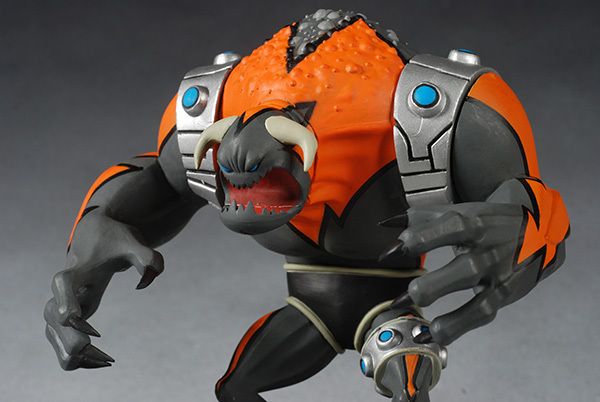 With the 30th series, Mcfarlane Toys took the style in a more traditional (these days) animated look. These figures have been based on the online comic book that you can find at Mcfarlane's website. Spawn 32 follows that up with seven more characters. 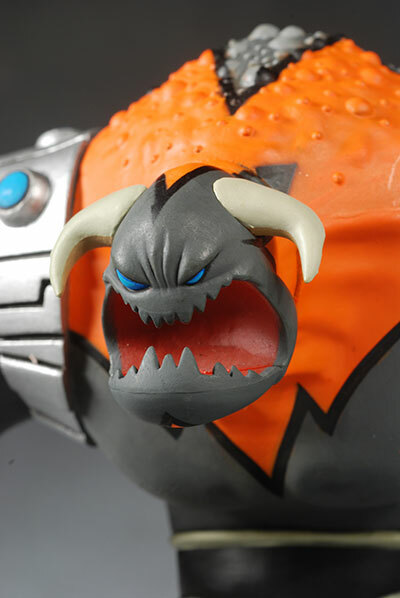 There's a repaint (blue) of Spawn himself, plus a repaint of Omega Spawn (gray). I skipped those two entirely since I wasn't particular to either repaint. They've added five brand new characters though - Commando Spawn, Raven Spawn, Agent 8, Creech, and Tremor. You won't see Commando Spawn in this review, because I haven't quite convinced myself yet that I need him, but I'll be covering the other four in detail. 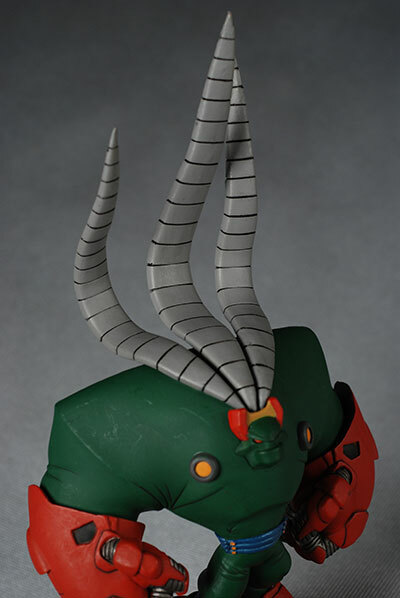 There's also a set of Phelbiac Brothers that will be a Spawn Collectors Club exclusive. They should hit fairly soon. You can find these at Toys R Us right now for about $13 a pop. Yes, you heard that right. Oddly, I didn't find nearly as many online dealers carrying this line, so TRU may be your best bet. Mcfarlane has switched to a smaller clamshell, and it works fairly well. I'm all for clamshells (less shelf wear and damage) and I'm all for less waste (no need to store or throw out more packaging than you need to do the job), so you know I'm going to like these. However, the inserted backer card is a bit too plain for my tastes, and in general the packaging lacks the eye catching look that they usually have. If you're a fan of the animated style, you'll enjoy these. If you aren't, then the odds are pretty good that you won't like them. But that's a matter of style, not quality. The sculpts here sport all the quality and artism that the more complex designs do, and yet manage to do it with a simplicity that is difficult to pull off. People assume that if a design is 'simple' it's 'easy'. Anyone that's ever worked in sculpture will tell you that's not true, and actually capturing a look and feel with LESS detail is often harder than throwing a ton of detail at something. There's nothing for the sculptor to hid behind here. There isn't so much to see that your brain can't take it all in. Instead, any flaws or bad designs become obvious to even the casual observer. These guys are all in the same scale as the first series, although some folks may find Creech and Tremor too small. They are about the same height as Spawn, maybe a smidge shorter and that doesn't really look right to me. But that's really my only complaint with their design. Agent 8 is quite tall in comparison, which again seems off to me. Scale seems to be a bit of a general issue for the two Adventure of Spawn series. Agent 8 also has the huge gun permanently attached to her left hand. 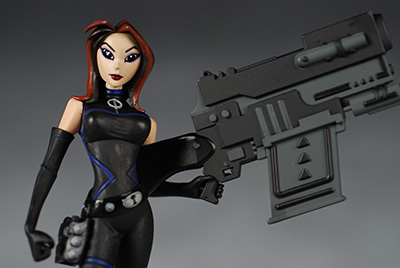 With those itty bitty feet and that huge gun, there's clearly no way she'll ever stand without the included display stand. The other three figures stand fine on their own as long as you play around with them a bit. The design of Agent 8 looks good though, with a nice leg and upper body pose. Creech loses points because he simply doesn't translate as well for me into this style. With the other figures, there is still some real visual pop, but the small head and too basic appearance of Creech robs him of personality. In the package, I was pretty impressed with the general quality of the paint. For the most part, cut lines appeared clean, and there's some terrific bold colors being used here. Unfortunately, out of the package I wasn't quite as impressed. The work isn't awful, but I started seeing more slop on most of the figures, as well as the annoying rub marks. You know these marks - they usually appear on darker colors, and effect the finish. Agent 8 and Creech were the worst offenders, but they were showing up on Raven Spawn as well. 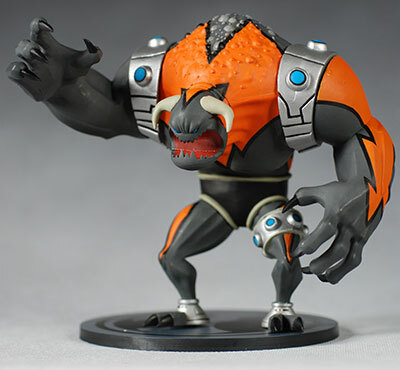 Tremor had the fewest issues, probably because the colors used on him are less prone to the rub marks. None of these are highly articulated. In fact, these are about as unarticulated as you can get and not quite be a true statue. Agent 8 has a cut neck, along with two cut shoulders. She also has a cut joint at the top of the glove of her right arm, but nothing like that on the left. There's no waist or leg articulation. Raven Spawn has the most articulation above the waist, with a cut neck, cut shoulders and two cut arm joints. he also has a waist joint, and two cut joints at the top of his boots. Creech has cut joints on the shoulders, top of the boots, and top of the gloves (although these particular arm joints barely move), but no neck due to the design. He does have bendy hair tentacles though, although I'm not quite sure how you'll end up using them. I gave him an extra half star for the inclusion though. 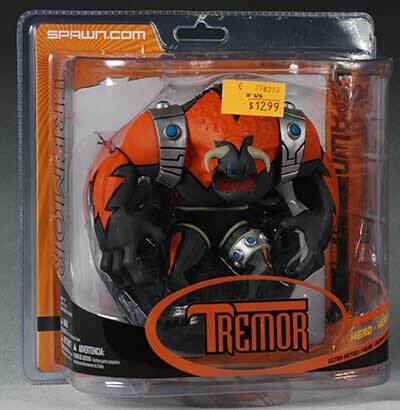 Finally, there's Tremor. He has a cut neck, cut shoulders, and a cut waist. Again, none of these figures is really intended to be particularly poseable. Since Agent 8's gun is permanently attached to her hand, her only accessory is the display stand. That's true for Creech and Tremor as well. 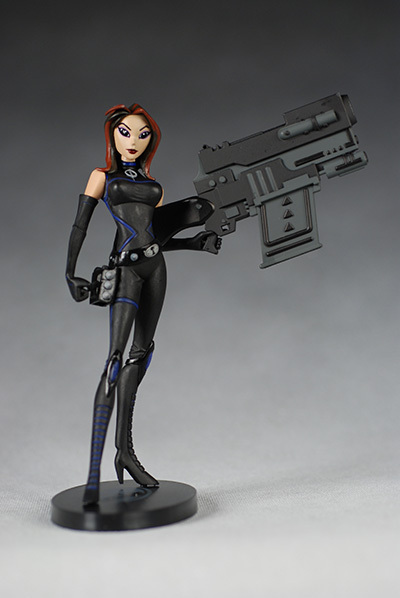 Agent 8 is the only one of the figures that absolutely needs the stand, but I bet you find yourself using it with the others as well. The pegs on the stand are designed to work with the feet in only one way, so pay attention to which peg is larger and smaller. Raven Spawn gets better treatment in this category. 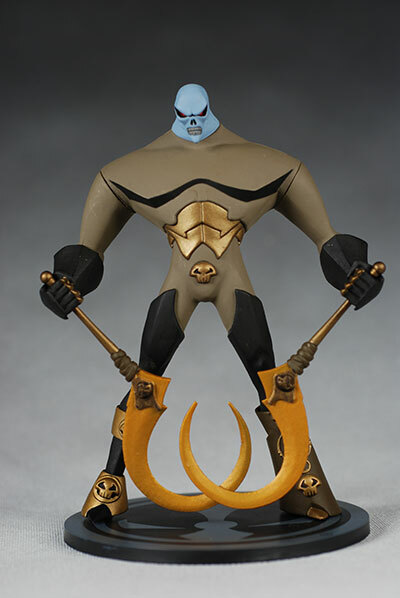 Of course, he has the display stand, but he also has two of his special sickles, which fit nicely in his hands. The ball on the end of each handle pops off to allow you to easily insert it in the hole in his hand, and then reattach the ball. Yes, they really do pop off, but it took a lot of work on mine because the paint had sealed them pretty tightly. Pull straight though, and they should come free. I wouldn't twist, because you could twist the peg right off. 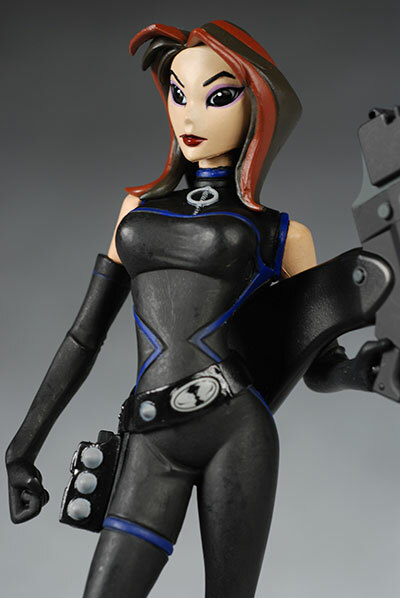 Raven Spawn's cape/cowl is also removable, so I'm counting that as another accessory. It fits well and looks terrific on. Unfortunately, that's it for these guys. 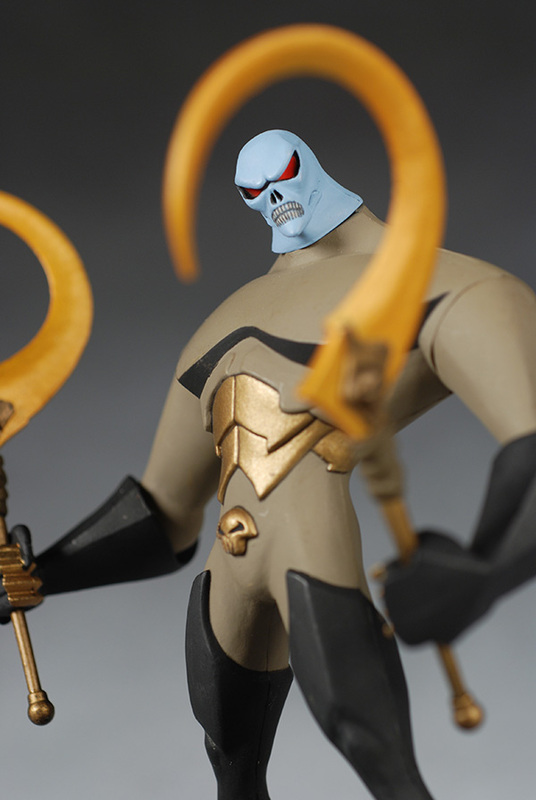 The Spawn X has lots of goodies, but the larger figures seem pretty short on accessories. The bigger figures here - Tremor, Creech, Commando Spawn - are fun figures, at least in the same way that any big, chunky not-too-articulated action figure is. I can see characters like Creech and Tremor fitting in with other lines like Ben 10 or Justice League, even with some scale differences. But in the end these are still really intended as collector figures, not toys, and the playability is reflected in that target market. These aren't licensed figures, but rather a in house property. At $10 a pop, Spawn figures were a good value. At $13, not so much, especially for those looking to be an entire series. Not much. They're all very sturdy figures, but I would avoid rubbing them against each other - or other hard surfaces - to avoid paint damage as much as possible. I also snapped one of the pegs off the display stand for Agent 8. Considering how critical her stand is, that's not a good thing, so take extra care. If you hate the animated style, you'll hate these. If you're open minded, it's possible that you'll find certain characters appealing, particularly if they are characters you have a thing for in the first place. 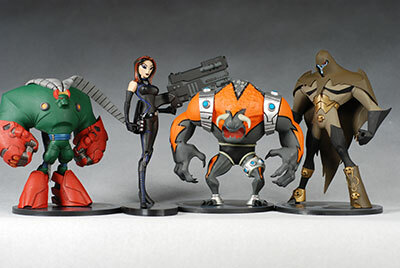 And if you're like me and love any animated style, these will be some of your favorite Spawn figures in years. The biggest disappointment here for me was the paint and the inherent rub marks on the finish, which hurt the scores almost across the board. I'm also not really happy to see these at $13 each, since it limits how many I'll end up buying (ruling out the two repaints entirely, and making it less likely I'll buy Commando Spawn). But I'll be happy to put these four on the shelf with the first series. I snagged most of these at Toys R Us, but finding Agent 8 might be a bit tricky for awhile til the 'dealers' (and I'm using that term rather loosely here) stop buying her simply because she's the female figure in the line. The weird part is I don't have any sponsors right now carrying this series - is that becoming common with online retailers? 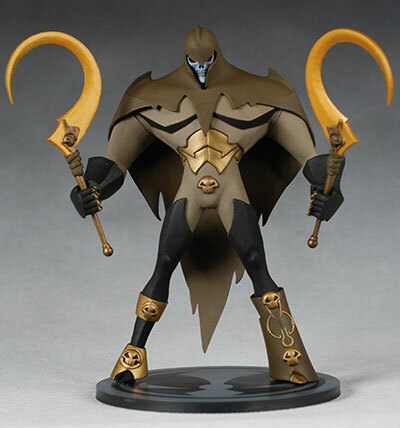 - the RAH Medicom Spawn is one of the best to ever hit the shelves. Of course, it costs like it's the best too. - Series 31 included Nightmare Spawn. - prior to that was series 30 of course, and Spawn 29 Zera and Thamuz. - from Spawn 28, I covered the Mandarin Spawn 2, the Gunslinger from Spawn 27, the entire Spawn 26 wave, several of the Spawn Reborn line, more of Spawn Reborn, and Spawn Mutations, the Tenth Anniversary Spawn and Ripclaw, most of Spawn series 25, Gargoyle Spawn and Santa Spawn from series 24, Skull Splitter from Spawn 22, a couple of the Spawn 19 Samurai Wars, more of the first series of Spawn Reborn and Spawn Mutations, and the Clown from the first series of Spawn Reborn. 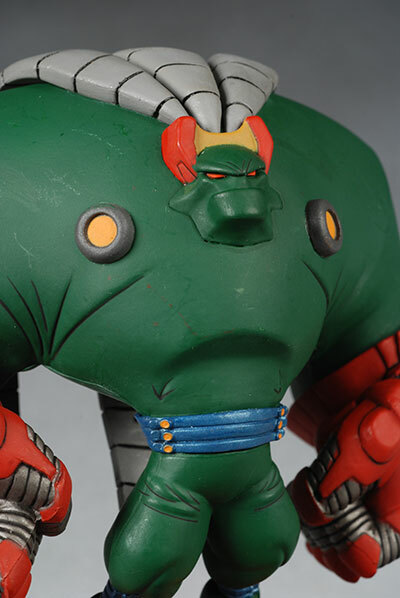 - there's also the second 12" version of Mandarin Spawn, and the 12" version of Spawn i.95.